M-Audio launched a remake of the Revolution 7.1 - Revolution5.1. 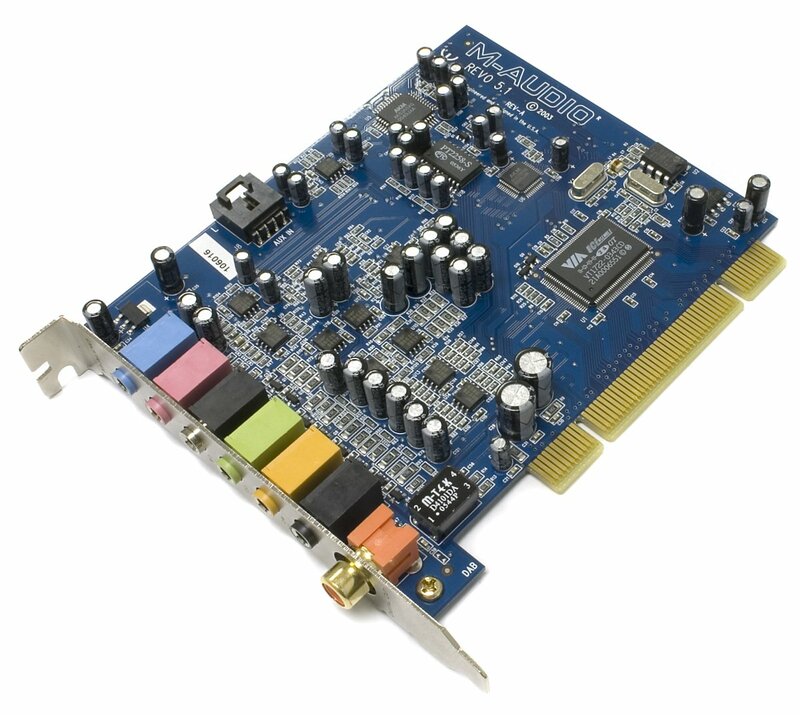 Revolution7.1 was the first multimedia card to support 7.1-channel sound. Like most products with a new super feature, it was quickly pushed out of sight by new competing products with better design. And this card was put up on the board of honor of the company, labeled "we were the first". 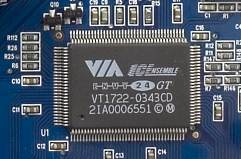 The manufacturer now has two multimedia PCI cards in the series. Revolution7.1 is formally the top card, its price is even higher by $20. But in fact, it should have been Revolution5.1 with DAC AKM 4358 of a higher quality (the same DAC is installed in professional cards ESI Juli@ and Audiophile192), an additional headphone output jack and internal AUX. As the Revolution7.1 had been pushed aside by competing products, it will be interesting to see how competitive the new Revolution5.1 is. 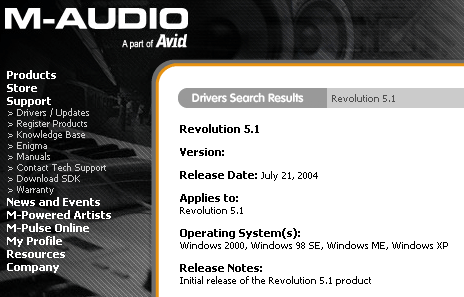 Revolution7.1 resembled a professional card with unbalanced mini jacks and a friendlier control panel of the drivers. Engineers fixed some drawbacks in Revolution5.1. 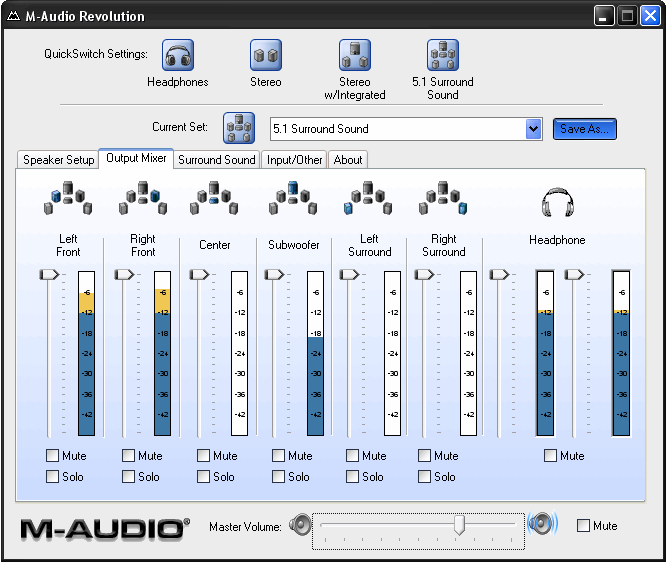 Front surround channels are not replaced by a separate output for headphones. There appeared an internal AUX connector for a TV tuner. There is no digital input - engineers probably decided that CD-DA data could be read via the bus only and that it was necessary only for Pro Audio. Nevertheless, if you have a Creative sound card for games, you'd better have a digital input not to re-plug wires from one card to the other. PCB design will please overclockers, there is plenty of free space on the PCB. At the same time, there is a drawback for other users - no duplicates of connectors for external jacks on the front panel. 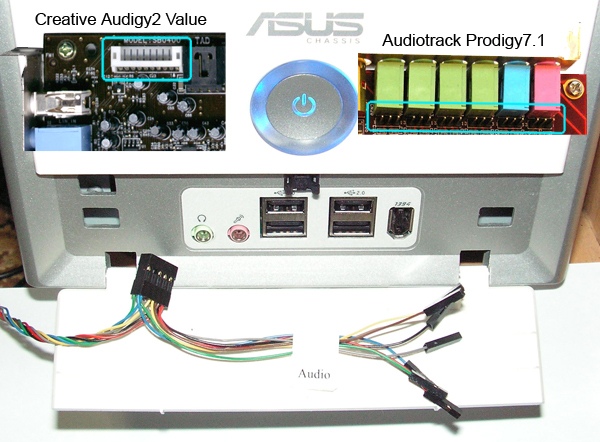 For example, Prodigy7.1/Aureon Space/Sky and sound cards from Creative are equipped with duplicate connectors for headphones, mike, etc, for external jacks on a PC case. You cannot do that with Revolution5.1. Revolution7.1, Prodigy7.1, and Aureon Space7.1 use a different digital controller - Envy24HT with five I2S/AC-link outputs. 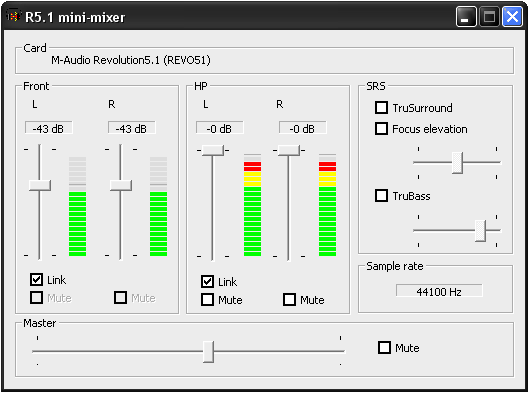 Revolution5.1 uses a simpler controller with just three outputs, which are sufficient only for 5.1. Revolution5.1 got popular due to its AKM 4358 DAC. 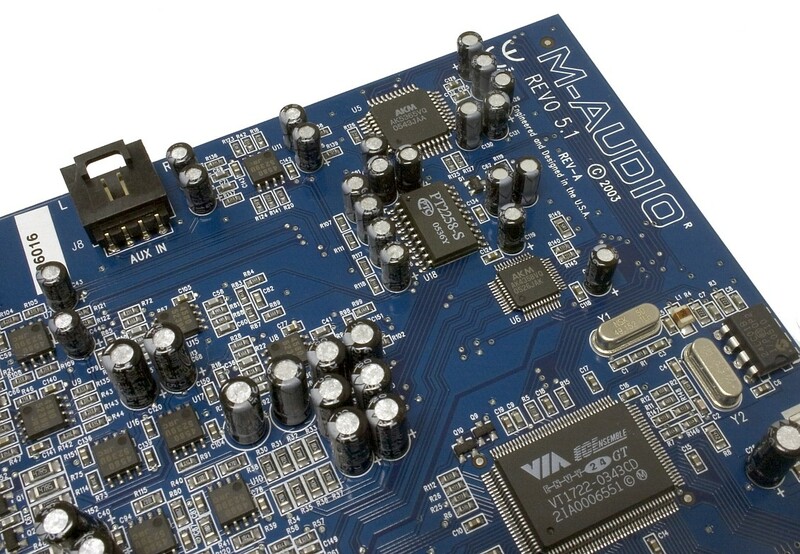 The same DAC is used in professional sound cards ESI Juli@ and M-Audio Audiophile192. 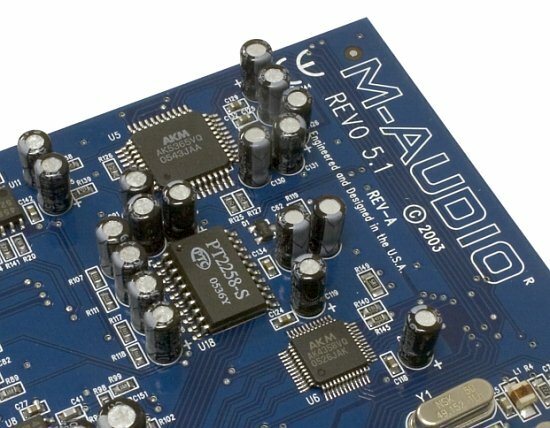 Considering that most buyers of Revolution5.1 cards are not musicians, the lack of balance connectors and some features in drivers makes no difference to them. But the twofold difference in prices attracts many people, who need this card only to listen to music. The ADC quality is more than sufficient to convert various records to digital form. Two CDs with WakeBoarding (game). The software bundle is minimal for such a card, but few people pay attention to the bundled software. Nevertheless, cards that have to do with Pro Audio often come with professional software. Many musicians realize already that it will be cheaper to buy a certain sound card than to buy its bundled software separately. That's why manufacturers usually specify which bundled programs are registered, and which are just demo or trial versions. The box of M-Audio Revolution5.1 does not mention that Ableton Live4 is a demo version. By the way, the current demo version (Version 6 at the time of our article) of Ableton Live is always available for download on the official web site. I'd like to hope that in future M-Audio will inform buyers better about bundled software and use newer program versions. Control panel of the drivers does no differ much from the control panel of Revolution7.1. On the whole, the control panel is good. Graphics elements are kept to minimum, it opens fast. But cards from ESI/Audiotrak are more convenient - input and output channels are controlled on a single tabbed page. Control panels of Creative cards from the Audigy series open noticeably slower. X-Fi drivers did not get rid of latencies and tabbed pages, but they got animated graphics elements, which look more like a slide show on old computers. We should mention the Speaker Bass Management option. When activated, low frequency signals from all channels are redirected to a subwoofer. Many users complain that when they use a subwoofer from a home theater with X-Fi, Prodigy and professional multi-channel cards, the subwoofer works only for 5.1 DVD-V. It keeps silence in stereo mode. Interestingly, the low frequency channel is allocated even for Kernel Streaming and ASIO. M-Audio programmers went wrong with assigning channels. It's a common solution to assign rear channels to the third and the fourth channels and to use the fifth and the sixth channels for center and sub. It's vice versa here. When you play a DivX movie with an AC3 track (4.0 output), rear channels are routed to center and sub. In 2.1 mode, sub is routed to the central channel. In 4.1 mode, sub is routed to the central channel, left rear channel is routed to sub, and the right rear channel is routed to the left rear channel. Bass management becomes useless with this channel mess. Besides, owners of some acoustic systems will have to modify wires that go from the sound card to the amplifier. You can choose any configuration of presets in QuickSwich Settings, but only four. Let's review the main presets. Headphones - output to headphones only. The signal is duplicated to the front output and is muted at the level of 70 dB. This signal does not depend on a Master Volume level. It's not very convenient, if you adjust volume in your sound card instead of an external amplifier. Stereo and Stereo w/Integrated subwoofer (triphonic, sub receives the signal together with satellites) - output to headphones and front-out. Output to headphones copies front channels. 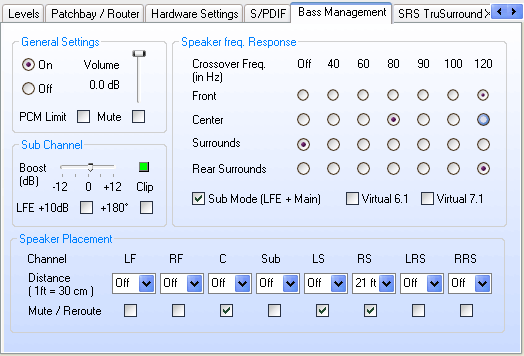 Even though you can choose crossover to cut off low frequencies, crossovers work only when you activate SRS TruSound. This mode reveals absurdity of the front output in Headphones mode. Although the front signal is duplicated, volume levels are adjusted individually, minimal level being -70 dB. If you mute the front channel, no signal will be applied to the front channel. But the Headphones signal disappears as well. Headphones peak meters do not show true signal levels. The pure sinus of the constant amplitude at the front output is at the constant level, peak meters at the Headphones channel show lower values, though the analog output signal is OK. Stereo w/Discrete Subwoofer - you are supposed here to use a separate subwoofer connected to a subwoofer output of the sound card. Crossover in this configuration separates low frequencies from the front signal and routes them to the subwoofer in accordance with the selected frequency. You can choose the following frequencies: 40, 60, 80, 90, 100 and 120. Bas to Sub + Mains - low frequencies are routed to the subwoofer, but the front channels retain their low frequencies. The Phase+180 function is used to coordinate satellites with the sub, you can also set a delay. The latency is calculated relative to the specified distance to the subwoofer (feet). The distance range is from 0 to 30 feet, which corresponds to 0-30 ms latencies (one ms per foot) according to the test signal. 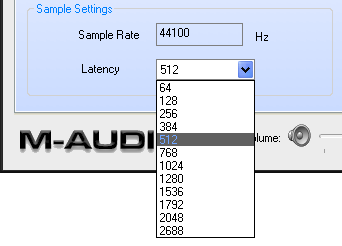 You can set the latency for all signals, including sub, in 2.1, 4.1, and 5.1 configurations only. As the headphones output copies the front output, crossover cuts off low frequencies as well. 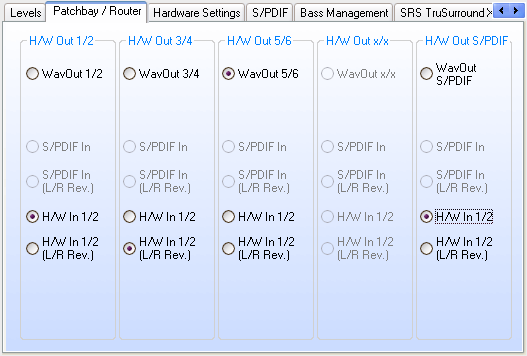 M-Audio Revolution5.1 can assign a LF channel to sub, which differs this model from many other cards. Nevertheless, you shouldn't forget that you can also assign a signal to sub in X-Fi in Creation Mode mode. In Entertainment and Game Modes you can assign a LF channel only for 5.1 configurations (Bass Redirection). That's why Revolution5.1 has a little advantage with theater subwoofers in 2.1 and 4.1 modes in games. Thanks to flexible signal routing in DirectWire3.0 control panel, Prodigy7.1 can do practically everything with the signal, you can send any channel to any output with NSP or a similar program. It provides much more opportunities, but it requires skills with professional software. Revolution5.1 offers a very convenient way to control its few functions. But there is a drawback in crossovers. Processing a signal close to 0 dB (maximum volume level) results in clipping. To avoid it, you should reduce the Wave Out volume in your player or in Windows volume control by approximately -3 dB. Control panel of the Revolution5.1 lacks this control. We should mention the Bas to Sub+Mains option. When activated, it reapplies the extracted low frequencies to the front channels. 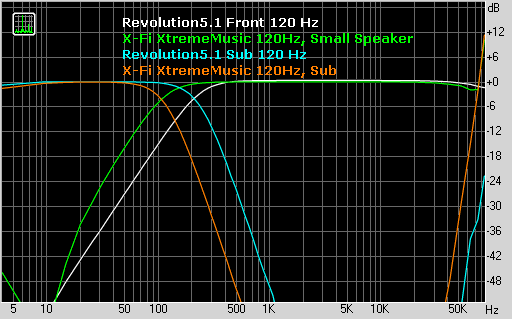 Compare X-Fi XtremeMusic and Revolution5.1 - theoretically, their results should be the same. X-Fi XtremeMusic Entertainment Mode, 5.1 configuration, THX settings: Bass Redirection On, Front Large/Small. The front signal is not processed in Large mode. The sound is not split into channels in 5.1 mode without CMSS, it's like in Revolution5.1 Stereo w/Discrete Subwoofer mode. When you activate Bas to Sub+Mains, the filtered signal is not merged correctly, Phase+180 (the orange line) does not help. Specified channel latencies do not take part in the merge process, so it's impossible to adjust signal phase. 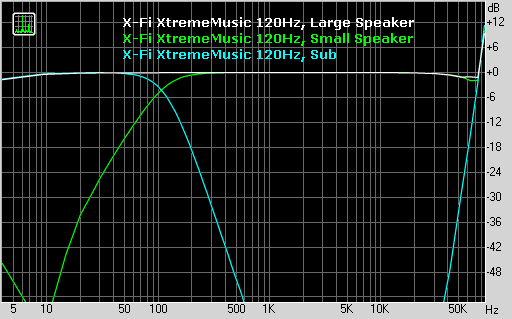 Crossover frequency selection in both products is nominal, 110 Hz for X-Fi and 210 Hz for Revolution5.1. Both cards do not clip high frequencies in 192kHz mode. Multichannel modes. 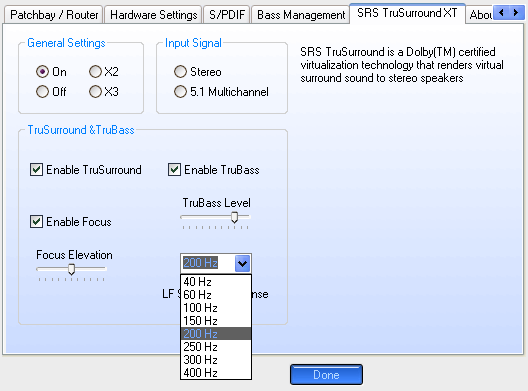 When you activate Sensaura or SRS TruSound in multichannel modes, stereo sound will be expanded to multichannel audio. Peak meters do not work in Sensaura mode. Crossover works only in 2.1 and 4.1 mode, when Sensaura is activated. In case of 5.1 configuration, stereo sound is expanded to all channels, but there are no settings to adjust it. Digital - analog outputs are disabled, digital output is enabled. Digital output does not work with analog outputs in any configuration. When in Digital mode, the card works in Direct mode and you cannot adjust even the general signal level. Moreover, you cannot activate Sensaura in this mode. By the way, X-Fi and Prodigy cards do not have these limitations. Their digital output just duplicates the front-out, there are no problems with a stereo stream in games. When the audio stream is played back via ASIO, it's routed to DAC instead of SPDIF. When two programs are started (one program plays the audio stream via DirectSound, the second - via ASIO), DirectSound audio goes to SPDIF, ASIO audio - to DAC, which means that there are no hardware limitations for simultaneous playback via DAC and SPDIF, the problem is in drivers. Controlling analog inputs is problematic. You select a sound source on the Inputs tabbed page. You can also adjust the input signal level here. The AKM 5365 ADC has a function to detect clipping and to reduce a record level automatically. It allows to maximize a record level, to apply the loudest audio section to the input and then convert it to digital form. In practice it's different. The function to detect clipping is disabled by default. When a certain threshold is exceeded, the protection system disables the input signal. But there is a nastier problem - there is no option for audio monitoring of the recorded signal (Revolution7.1 offers "Enable monitoring"; Revolution5.1 must have the Active input option, which is actually missing in the control panel), so you don't know whether there is clipping or no. Peak meters won't help here, because they work according to the same silly algorithm as for the headphones output. The screenshot shows that the signal does not exceed -6 dB, but audio recording programs detect clipping. When you activate monitoring for recording or monitoring in the editor or sequencer, you will hear distinct rattle. That's why you should pay attention to peak meters in a recording program, or still better to enable monitoring in the editor/sequencer. 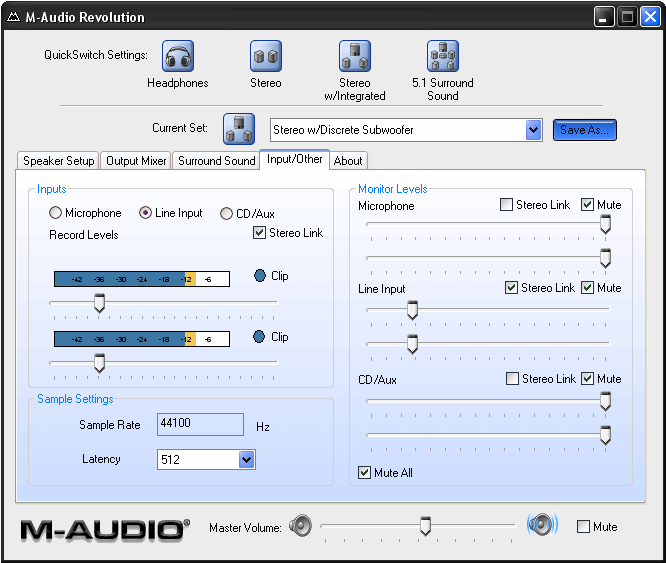 You can enable signal monitoring and input auto calibration in the control panel from Audiophile 2496 installed for Revolution5.1, read about it below. Monitor Levels group allows to listen microphone, linear, and AUX ins from the front output only. A specified signal level has no effect on recording. Moreover, signal level cannot be adjusted via Master Volume, it's very inconvenient. If you connect a tuner to the analog input, you won't be able to adjust input signal via a multimedia keyboard, mouse, or remote control. You also cannot listen to the tuner in headphones or expand the sound to all channels using Sensaura or SRS TruSound. This volume control is not a software bug, it's a hardware limitation. Line-ins are adjusted with the six-channel volume control PT2258-S and routed to the analog output parallel to DAC. M-Audio programmers haven't implemented synchronization with Master Volume level. The Digital preset does not disable the ADC, but you cannot route the digital stream to SPDIF by default. When you enable monitoring in the editor, a digital signal is routed to DAC instead of SPDIF. The line-in has the wrong arrangement of connectors, left and right channels are mixed up. You should take it into account, when you record audio and play it back via the through channel. The last tabbed page shows a driver version. After you install a card, you usually want to install the latest driver. The only driver on the manufacturer's web site is over two years old. It would have been all right, but for various bugs in the driver. In this case we understand that the company gave up supporting this card long ago. There also arises a question whether your installed version matches the one on the web site. As you can see, the web site specifies the date only, and your driver mentions only its version. According to its properties, the driver installed has a different version and an earlier date. Driver info did not change, after we installed the driver from the web site. A double click on the icon in the tray opens control panel, a left click opens a small menu, where you can activate Sensaura or TruSurround. We'd like to see options to switch between HP/2.0/..../Digital modes like in Quick Switch Settings. You can get rid of some bugs and get access to some functions by using a control panel from Audiophile 2496 Delta. 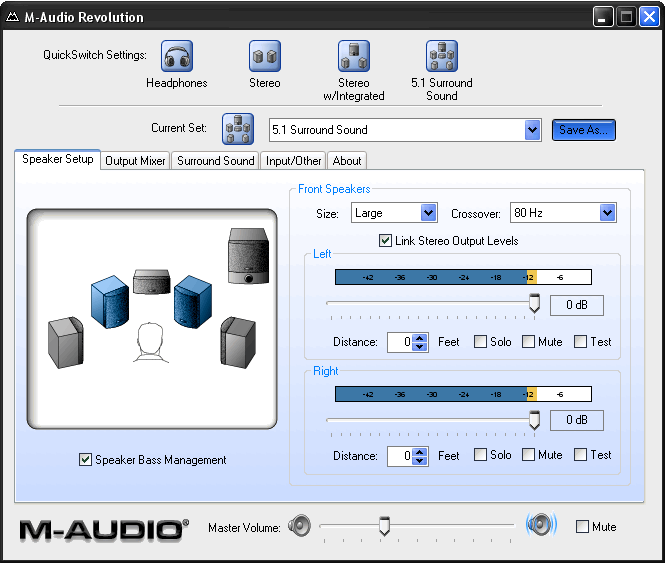 Audiophile 2496 control panel does not replace and does not provide the same functions as in the native control panel from Revolution5.1, even though it seems universal. Some settings cannot be adjusted. The first tabbed page shows only levels, and you can choose between Mic/Line/Aux inputs and input sensitivity only in the native Revolution5.1 control panel. After you start the control panel from M-Audio Delta, ADC gets auto clipping. Each row is one of physical outputs of the card, three stereo couples (headphones out is combined with H/W Out 1/2) and SPDIF. WaveOut x/x - that's what your Winamp, PowerDVD, etc play back. You cannot swap front and rear, WaveOut 1/2 is bound to H/W Out 1/2, etc. You also select a stream at SPDIF: either WaveOut or the signal at ADC. Now you can safely plug the tuner to AUX and listen to audio in headphones or any other stereo couple. Monitoring in 2.1, 4.1, and 5.1 mode does not send LF signal to sub. You can adjust output levels and specify latency in Hardware Settings. SRS TruSurroundXT now has the crossover to sub option. Maximum frequency - 400 Hz, probably for the cheapest plastic subs. We should also mention another third-party control panel. This control panel is developed by our forum user, aka hlabs. As you can see on the screenshot, this control panel is intended for 2.0 and HP presets with an option to activate TruSurround. 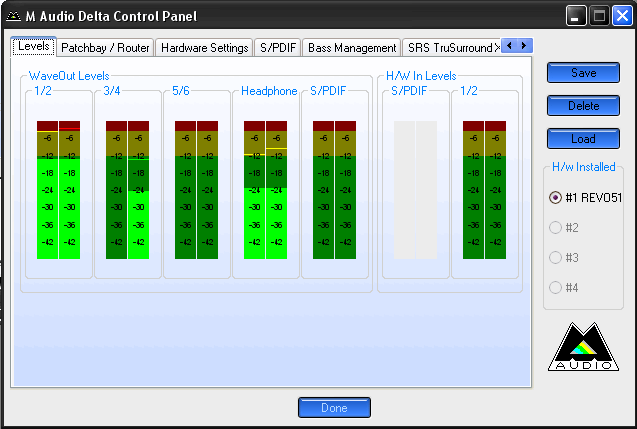 Diagnostics of Revolution5.1 features in RMAA in Sensaura mode. Revolution5.1 is stable in games. Audio quality is worse than in Creative Audigy2 and X-Fi cards, because of the old software algorithms of Sensaura and support for EAX 2 only in games. The card does not offer much in games. But its features are still better than integrated audio and QSound cards. When Creative bought Sensaura, many Envy-based cards got support in games with QSound algorithms (worse than Sensaura). ASIO driver is detected correctly in professional programs. Latency is specified in samples. A minimum latency of 64 samples (sampling rate: 44.1 kHz) is 1.45 ms. The card did not rattle in CuBase SX2 and Ableton Live5 sequencers. But it does not mean that having upgraded your old Live5.1 with KX to Revolution5.1, all projects will work with lower latencies. The minimum latency depends on sound drivers. But the lower the latency, the higher the CPU load. As a rule, even top computers work with 5-10 ms latencies, even though sound cards can provide 1-2 ms or lower. For example, minimal latencies for large Ableton Live5 projects, that generated no rattle for X-Fi XtremeMusic, Revolution5.1, Prodigy7.1 and E-MU1212m, were the same, even though the cards are of different classes and positioning. Unlike E-MU1212m and X-Fi XtremeMusic, you cannot change buffer size without closing all players. Prodigy7.1 has the same problem. But when you try to change the buffer, you get a message to close all audio programs, including icq clients and monitoring programs (they play back silence in pause mode). Revolution pops up no messages, the menu shows the new buffer size, which will take effect as soon as you close all programs that play back audio. As you can see, the card has only two channels for recording and eight channels for playback. Each channel has a label. But these labels are not adequate. SPDIF does not work in Digital mode under ASIO interface, audio stream is rerouted to analog outputs according to this table - we compiled it experimentally. There are only six playback channels in all modes. ASIO capacities of X-Fi and Audigy2 Value cards differ only in frequencies. 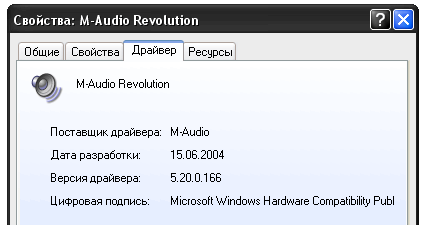 M-Audio Revolution supports 176 kHz and 192 kHz, but only for playback. In practice, this feature allows to create multi-channel records of what's played back by the sound card. It can be a record of DVD-Audio, a movie sound track, a multi-channel sound track of a game or any other program. 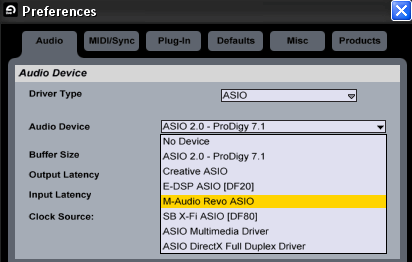 Prodigy cards from Audiotrak and Audigy1/2/4 cards with KX drivers do not only record multiple channels, they can also route an audio stream to ASIO program only without routing it to DAC. Its allows to use professional VST effects (parametric EQ, compressors, etc) for real-time high quality installation of all ACs in a given room, to use Bi-Amp in phase-linear filters, etc. In case of WDM drivers, Creative cards offer a choice between Wave Out Mix and What U Hear (Wave Out Mix+Analog in), to make a stereo record of what the card is playing. Revolution5.1 cannot do that. Recording is possible only for Mic/Line/Aux. For example, many web sites allow to listen to music only from a browser, you cannot save it. Usually, you can start a recording program and set the source to wave. You cannot do that with Revolution5.1. Such functionality of Revolution5.1 is even lower than in integrated audio. The only advantage of Revolution5.1 over integrated audio is hardware ASIO with lower latencies and a larger range of frequencies. Front output values are a tad worse than at the other outputs. It has to do with the cut-through Line/Mic/Aux input. Nevertheless, S/N of the rear output sometimes reached 107 dB. S/N at other outputs was about 109 dB, which conforms to the official specs. The manufacturer specified real readings instead of specification values of the converters. Here is a table with results demonstrated by Prodigy7.1, X-Fi XtremeMusic and E-MU1212m in non-balanced 24 bit mode. As you can see, all cards outperform the reference 44.1/16 signal in dynamic range and signal/noise ratio. 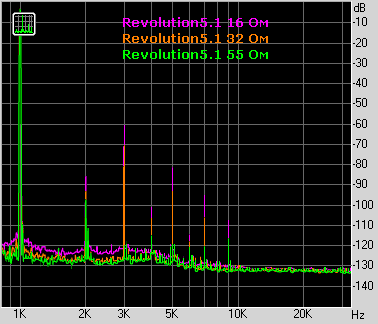 Some people may doubt that a sound card with a better DAC and higher Dr and S/N will sound better even in 44.1/16. Nevertheless, all parameters are interrelated, and a DAC with low Dr will not demonstrate high IMD. The table shows that the best Dr and SN results are demonstrated by E-MU1212m. 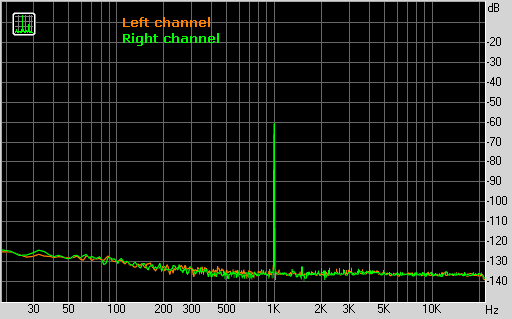 Although the card has advantage in these parameters over the reference file, the E-MU1212m just approaches harmonic distortions of the reference signal. In fact only this card can provide accurate playback of a 16bit signal in the above-mentioned parameters. The other cards fail in one or two parameters. Digital output works correctly, it's a tradition among Envy24XX cards. We used ADAM S2.5A studio monitors ($3800) for our tests. We compared audio quality of our model under review with ESI Juli@ and M-Audio Audiophile192. All these cards use the same DAC. So we can assume that they offer similar audio quality. Audio quality of cards mostly depends on a built-in amplifier for headphones. Results may differ much for ÀÑ. Front output and headphones signals are different. Different output signal levels were demonstrated, when we used different headphones. The higher the impedance of headphones, the smaller the difference between the levels. 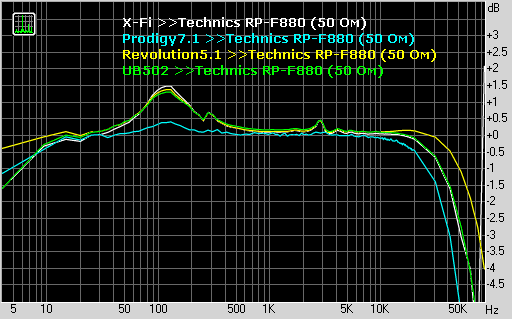 In case of Technics RP-F880 (50 Ohm), HP output is a tad louder, stronger LF. Amplification is sufficient for most headphones. Nevertheless, insensitive headphones need a separate amplifier. HP output failed to "stir up" Amphiton TDS15 (isodynamic headphones, Soviet Hi-End). We used popular Technics RP-F880 for comparison with other cards. 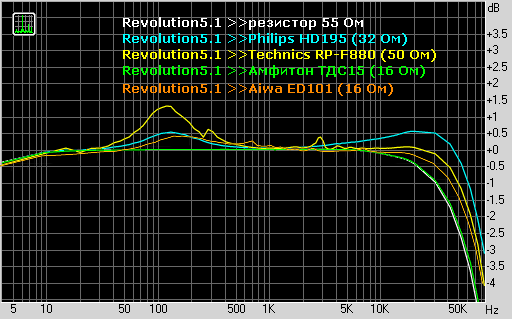 If maximum volume levels are similar, Revolution5.1 offers better quality. X-Fi offers less details and worse articulation in low frequencies. Differences between the cards are reduced at lower volumes. Prodigy7.1 leads in LF saturation, while Revolution5.1 demonstrates a distinct attack. Prodigy7.1 has a higher power reserve - its Master Volume was set to 87% to equal maximum volume of the other card. We measured headphones outputs under active load (variable resistor) with the resistance of 16, 32 and 55 Ohm. 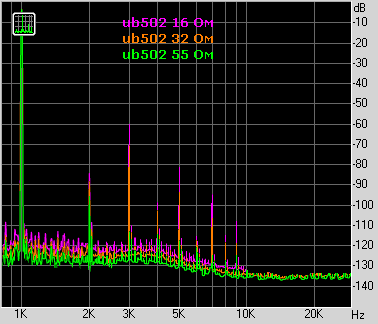 We also measured headphones output of the budget mixer Behringer UB502 ($50-70) connected to E-MU1212m. Interestingly, the isodynamic headphones did not deflect frequency response like the resistor. The popular Technics RP-F880 deflects frequency response at 100Hz by just 1.5 dB. Frequency response did not change, when we measured it with loads of various resistance. Real headphones may demonstrate different results, depending on impedance curve of headphones. We set the volume to maximum in all cards. Spectrums show that a low-resistance load makes all amplifiers go into non-linear mode of the amplification curve. According to psychoacoustics, the second and the third harmonics of a relatively high amplitude are much better masked by the keynote than higher plane harmonics of a low level. 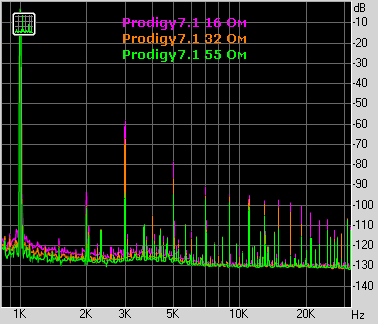 The "dirtiest" spectrum is demonstrated by Prodigy7.1. 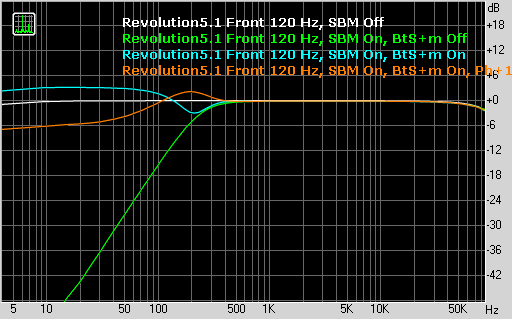 Revolution5.1 and UB502 show the purest spectrums. You are recommended to use an external amplifier with low resistance headphones (below 55 Ohm). As Technics RP-F880 caused most deviations in frequency response of the amplifier of all our available models, it will be interesting to see other amplifiers under this load. Prodigy7.1 leads here. Don't make far-reaching conclusions, because the difference at 110 Hz is just 1 dB. This difference falls within the measurement error for real readings of frequency response. Envy24XX cards used to compete with Audigy2/ZS models, which couldn't disable SRC 44>>48. It was a common situation to have two cards: one for games, the other for music. Now we can disable SRC in Audigy2 Value, Audigy4, and X-Fi cards. At the time of this article, the cheapest X-Fi card cost $120 versus $85 for Revolution5.1, which agrees well with the picture: Revolution5.1 is for music only, X-Fi cards are for games and music. X-Fi XtremeMusic OEM and X-Fi XtremeGamer BOX sales have started in Europe now. If we calculate the relative price to X-Fi XtremeMusic, X-Fi XtremeMusic OEM will cost just $65. 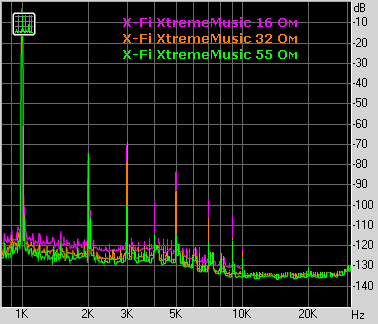 Considering a small difference in audio quality between X-Fi XtremeMusic and Revolution5.1, a better musical card for a junior X-Fi card will be the E-MU1212m PCI, based on top CS4398 DAC, or the E-MU0404 of the latest modification on top AKM4396. But drivers of professional cards from E-MU offer a steep learning curve. Audiotrak ProdigyHP, based on top AKM4396, would have been a good choice. But unfortunately, such cards are not sold in our parts. Delivery from abroad makes this card even more expensive, so you'd better buy all-purpose X-Fi Elite Pro, based on top CS4398, for $300. Revolution5.1 will be justified as a music card together with Audigy 1, Audigy 2, Audigy2 ZS, when a user is not going to upgrade to X-Fi. We should note the tendency of growing hardware quality in budget cards and their dropping prices. But unlike the market of video cards, where the difference shows in quality and 3D performance only, while 2D performance is practically the same everywhere, sound cards still have no common functionality standard. Having bought an expensive card, you may find out that it has much fewer functions than a cheaper product. You could come across such problems in times of Riva TNT1/2, which 2D performance was worse than in weaker S3 cards. Something like this is happening to sound cards now. It does not contribute to using a single all-purpose sound card in your PC. You are forced to buy several cards of the same playback/record quality, but with different functions in drivers. Now that PCI-E is pushing PCI slots out, only few users can afford to have several sound cards installed in their computers. 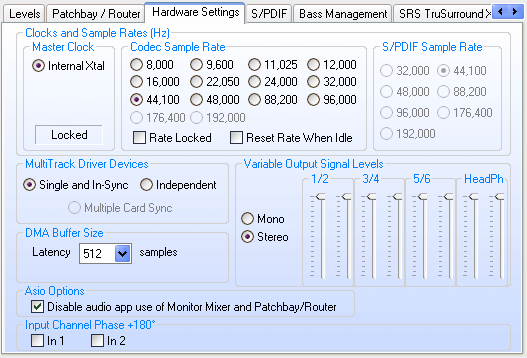 In the budget sector (near $100), a user should choose a sound card by such parameters as universality, functionality, convenience, certain features, or form factors of its connectors. 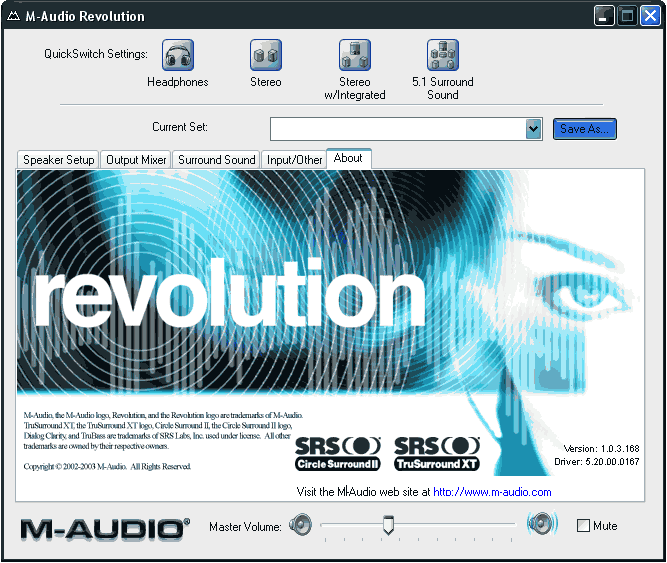 M-Audio engineers did a good job of overhauling Revolution7.1. They installed the high-quality DAC AKM 4358, separate headphones output, internal AUX, and still this card is cheaper. Unfortunately, its drivers are not free of bugs, and there are no updates. Expedience of the card is questionable, because the card is optimized for certain tasks, namely: playing music through any configurations (from 2.0 to 5.1) with a separate high-quality output to headphones, convenient control, and functional bass management. It's practically a perfect choice of a melomaniac, who needs nothing but high quality playback of music and movies. It will be a bad choice for beginning Pro Audio musicians because of intricate ASIO channel labels, primitive signal routing, and dead SPDIF in ASIO. Audiotrak Prodigy7.1 LT will be a better choice for working with sound - a separate output to headphones and a similar price ($85-$90). Or E-MU0404, ESI MAYA44. Gamers will gain nothing new from this card, it's little different from integrated audio in Sensaura algorithms. Junior X-Fi cards or even cheaper Audigy2 Value/Audigy4 cards that allow to disable SRC will be more expedient with the launch of X-Fi XtremeMusic or X-Fi XtremeGamer OEM.